Although typically treated as a fruit, rhubarb is actually a plant with a tartness that requires a complement of sugar. 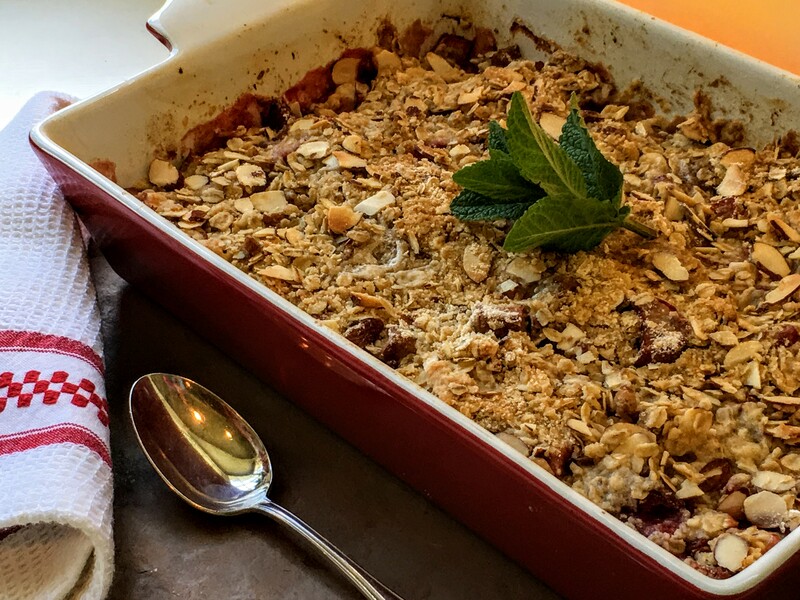 The dessert I had planned was a warm rhubarb and strawberry crumble (which calls for both white and brown sugars); it takes only 20 minutes to assemble and then about half an hour in the oven. For the filling sliced rhubarb and strawberries are dusted with sugar and aromatic spices including cinnamon, allspice, and nutmeg. A traditional topping of flour, oats, brown sugar, and nuts (I used sliced almonds) rubbed with bits of butter bakes to a golden crispness, while covering the bubbling juicy mixture beneath. This crumble was such a hit in my class last night that I thought I would share it here. It would be a delightful dessert to serve for Mother’s Day this Sunday, the 14th! You can make it several hours ahead, then reheat it for 20 to 30 minutes when needed. I garnished servings with dollops of mascarpone whipped cream scented with orange, but if time is scarce, offer scoops of a good vanilla ice cream to satisfy mom’s sweet tooth. 1. Arrange a rack at center position and preheat oven to 350 degrees F. Butter a shallow medium baking dish (about 2 quart capacity). 2. For the fruit filling, in a large bowl toss together the rhubarb and the strawberries. In a medium bowl mix the sugar, flour, cinnamon, all spice, and nutmeg together and add to bowl with fruit. Toss well to coat. Spoon the fruit mixture and any loose remaining seasonings into the baking dish and spread evenly. 3. For the topping, mix flour, sugar, oats, and almonds in a medium bowl. Dice 4 1/2 tablespoons of the butter and rub into dry ingredients, using your finger tips, until mixture resembles pea-sized clumps. Pat mixture evenly over fruit. Dice the remaining butter and dot the crumble mixture with it. 5. To serve, garnish center of crumble with 2 to 3 mint sprigs, if desired. Serve each portion warm with a dollop of Mascarpone Whipped Cream or a scoop of ice cream. Serves 6. 1. With an electric mixer on medium high speed, whip the cream until it just starts to thicken, and then add the mascarpone and sugar. Continue beating until firm. Remove and stir in the orange zest and 1 teaspoon orange liqueur. Taste and add up to1 teaspoon more liqueur for a stronger orange flavor. (Mascarpone cream can be made 3 hours ahead. Cover and refrigerate.) Makes about 2 cups. Cooking tip: If strawberries are not ripe all the way through and have a white core, be sure to cut out all the white cores and discard them. Measure enough sliced, cored berries to make 1 1/2 cups. This entry was posted in Food News and tagged crumble, desserts, mascarpone, Mother's Day, rhubarb, Spring by brosbottom. Bookmark the permalink. Betty you’ve done it again. We made this dessert today with frozen rhubarb and fresh strawberries and it was fantastic. The spices really brought out the best flavors of both fruits. This is a keeper. HAPPY MOTHERS DAY FROM OUR KITCHEN TO YOURS. Julie, thanks so much for your note! I’m so pleased that you liked the rhubarb and strawberry crumble for Mother’s Day! I made it again last night for a dinner party and it got winning reviews! Happy Mother’s Day to you too!